Has Your Legislator Co-Sponsored Constitutional Carry? Time is quickly running out for your legislators to co-sponsors Constitutional Carry before the April 4th deadline! We don’t want your Senator and Representative to be left in the dust on this important issue — as co-sponsors continue to pile up, it is time for them to take a stand FOR your gun rights! We need you to increase the pressure on them to be a co-sponsor — and we’ll tell you how in a few minutes! But first, we want to tell you about the growing anti-gun opposition that is already building across the state. It has only been one day since the filing of Constitutional Carry (LRB-2039/1) in Wisconsin and already the press and anti-gun groups are going nuts. They loathe you for the freedom you desire! The notorious anti-2nd Amendment group, Wisconsin Anti-Violence Effort, has been out in full force on social media and email, trying to squash support for Constitutional Carry. NYC Billionaire’s “Moms Demand Action-Wisconsin Chapter” is already flooding the inboxes of your State Senator and State Representative and urging them to kill this important piece of legislation. We have seen it in other states that have passed Constitutional Carry. Bloomberg rolls in with his out-of-state money and tries to shut Constitutional Carry down. Bloomberg is going to spread lies and falsehoods about you and Constitutional Carry! The anti-gun lobby always does. Facts aren’t important to them — stopping your freedom is! But it isn’t just the anti-gun groups that are out in full force right now. It’s the anti-gun politicians in Madison as well. We have already seen several notorious anti-gun Democrats penning articles and speaking out on Facebook against your right to keep and bear arms! Rep. Melissa Sargent (Democrat-District 48) and Rep. Chris Taylor (Democrat-District 76) are both anti-2nd Amendment politicians who would love nothing more than to strip your gun rights away. These two anti-gunners hail from Madison and will stop at nothing less than a full repeal of the 2nd Amendment. Even this year they have filed anti-gun bills such as “Universal Background Checks” and another anti-gun bill trying to bring back the “48-Hour Waiting Period” to buy a handgun for self-defense. With the anti-gun lobby hitting legislators from the outside, and anti-gun politicians hitting legislators from the inside — the war for Constitutional Carry is well under way! That means we need you taking action right away to ask that your Representative and Senator co-sponsor this important bill. Felzkowski, Bernier, Duchow, Brandtjen, Kerkman, August, Born, Brooks, Edming, Gannon, Hortacher, Hutton, Jacque, Jarchow, Katsma, Kleefisch, Kremer, Knodl, Krug, Kulp, Macco, Quinn, Ripp, Schraa, Skowronski, Stafsholt, Swearingen, Tauchen, Thiesfeldt, Tittl, Sanfelippo, Vorpagel, Weatherston, and Wichgers. Craig, Feyen, Nass, Tiffany, Vukmir, LaMahieu, Stroebel, Kapenga, Marklein, and Testin. That brings the total number of co-sponsors to 44! Is your Representative AND Senator a co-sponsor? If not, you have some work to do. Even if they are, we need you to call/email them and thank them for being a co-sponsor. In addition, you need to tell them to make sure that they only vote for the bill as is and without any watered-down amendments. So, what can you do to help fight back, and how can you reach your legislators? >>> First, type your address in the link here and your Representative and Senator’s phone number and email will pop up on the screen. Tell them to co-sponsor Constitutional Carry if they are not currently on the list and tell them “Thank You!” if they already are. >>> Second, our own Citizen’s Cosponsor Initiative is up and running! 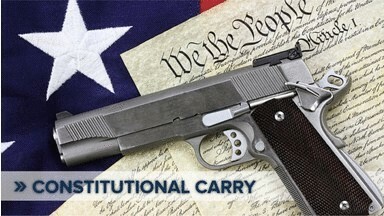 If you have not yet signed the petition for Constitutional Carry, then you need to do so immediately! >>> Third, we know that Bloomberg has far more money than we could ever hope to raise. But we have to fight back with whatever resources we can muster. Every little bit helps! Please consider a generous donation of $250, $125, or $75 right now as some have already done and help us mobilize gun owners across Wisconsin! If that is too much for your family right now then please consider a smaller donation of $50 or $25 to help us mobilize everyone we can! Timing is everything in politics, and the battle for your gun rights is no different. We have to act now and do everything we can to move this legislation across the finish line. P.S. Constitutional Carry is on the move and the list of co-sponsors continues to grow, with 44 legislators having signed on! April 4th is the fast-approaching deadline for your Representative and Senator to co-sponsor this historic piece of legislation. Now is the time for Wisconsin to pass Constitutional Carry! But it can’t be done without you and the support of your legislators. That’s why we need you to take action now. If you need help locating your legislator’s information, go here and type your address in the search box and you’ll be given the information you need. Once you’ve done that, please consider a donation to the Wisconsin Firearms Coalition so we can get more gun owners involved in this fight! Did You Hear What Senator Olsen Said About Constitutional Carry?